Did you know Laurie Wisbrun has yet another fabulous line coming out soon? You might remember some of these prints from a little while back – Laurie was offering them through her Etsy shop, and I bought a FQ stack to make a gray and yellow quilt for Max’s room (I hate to admit that they never quite made it into a quilt, though I do admire them in a lovely little stack on my fabric shelves!) I did make up a fun pillow for the rocker in his room though, and I was so pleased to hear that Robert Kaufman decided to pick up this line. It’s called Perfectly Perched and it will be available in July in these three great colorways. Can you pick a favorite? 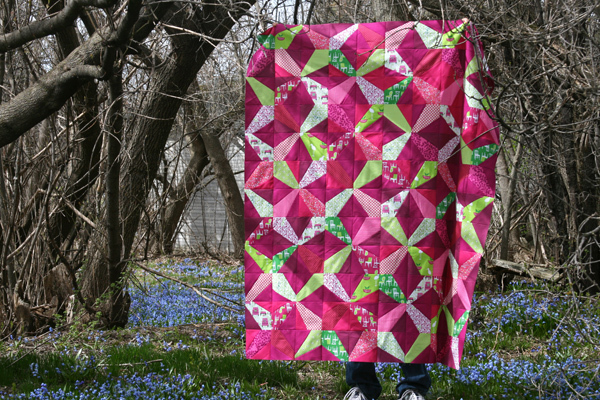 I still can’t, but decided to go with the raspberry and lime prints for my first quilt out of this line. I added in a few additional prints – that great circle print from Laurie’s Modern Whimsy line (and as an aside, many of Laurie’s circles go quite well with this new line… I’m just saying! ), a bit of flea market fancy, a little floral from Children at Play, and the Running Stitch print from Patty Young’s latest line. And now, the dilemma… backing? I can’t decide. Plum, lime green, some other color? Rather than think about it, I’ve set it aside for a while, but I’d really like to get it quilted, so if you have a suggestion, I’m all ears! This entry was posted in Fabric, Posts about Quilts and tagged handmade, laurie wisbrun, perfectly perched, quilt, quilt top, robert kaufman. Bookmark the permalink. Lime green for the backing and for the quilting thread! And maybe for the binding as well! I think I’d go for the lime although a pink might be cute. 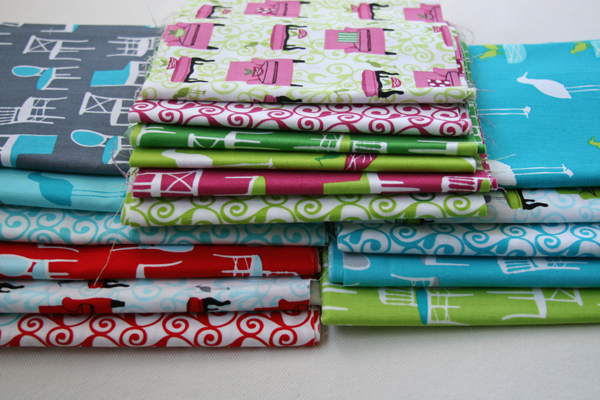 Either would be pretty cool with a plum stripe or that plum with the green chairs for a binding. 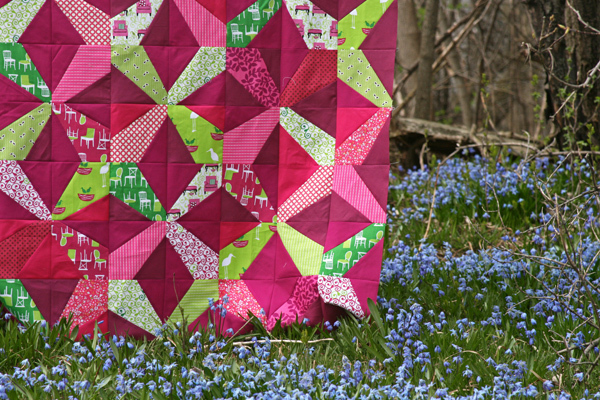 Love the quilt – the colors are fabulous. I would back with one of the green and white prints with maybe a block strip of plum and the lime green fabrica. What about a double sided quilt, with more of those lovely fabrics on the back? 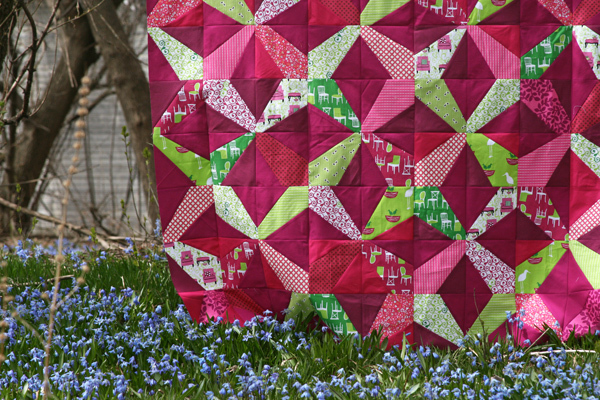 I love this quilt top – I would use lime green for sure!! Beautiful! definitely the lime green for the back. I confess that this shade of purple isn’t my personal favorite, but I LOVE the idea of the not-quite-matching solids! And I love Laurie’s fabrics! I’d do wide strips of lime green and plum. It’s a fun design using some really fun fabrics. I’m undecided for suggesting the backing but while I looked at it thinking about it, the greens never came to mind as a choice. I guess I’m your odd ball today. It’s a busy design so I would lean to a complimentary backing rather than one that would fight for attention. how about Marcia Derst fabric in the yellow and white stripe. I would go with lime green. Love the top. Even though it’s not present in any of the fabrics on the top, somehow a darker purple/eggplant color strikes me as working for the back too. Maybe using the lime and plum-pink colors in conjunction. You must back it in the lime green! Gorgeous! I just love Laurie’s designs–she is one of my all-time favorite fabric designers. Can’t wait until this line hits the stores. This color combination is great! For some reason, I really like the above suggestion of the yellow and white stripe. THis quilt has some serious razzle dazzle! Love it!! Raspberry and lime- one of my favourite color combos. 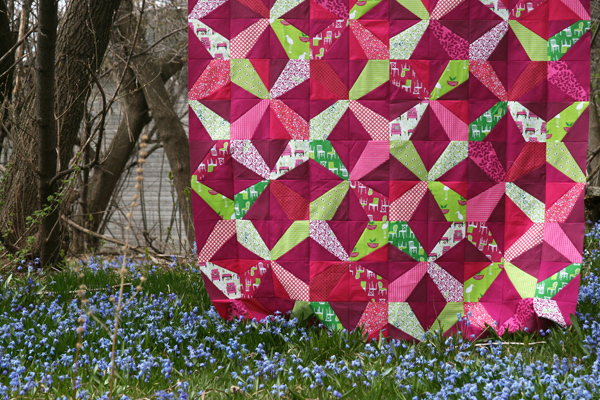 I love the different shades of raspberry in this quilt and the slightly wonky blocks. I think I would go with a pale to mid pink for the backing, something like the FMF seeds maybe with a splash of lime. Way cool quilt top. I’m amazed at how many cool quilts you produce. It seems just one great one after another….wow! Such a fun quilt Ashley! I think one of the green circle prints would look awesome on the back! still waiting for the grass to turn green! You’re so creative, the stuff you come up with is awesome. I’d love to see lime green on the back, that would look so bright and contrasty! Love your eye-poppin’ quilt! For the backing, I can imagine light gray and plum with some shots of lime green. Whatever you come up with, I know it’ll look fantastic! Love this one too. How striking. Don’t know why since I don’t see it in any of your swatches, but I think lemon or even gold would be lovely. With a strip of a few fussy cut Perches and pinks! Oooh, but how will you wash this one to keep the colors from bleeding? Do you just use a lot of color catchers? Oh, *wow*! That was first thing I said when your post opened. The contrasts here are so striking. I really love it! For backing… I hesitate to suggest Kona zucchini, an acid yellow/green, with some prints/plains from the front, of course. Maybe Kona turquoise, or peacock for a surprise element when you flip the quilt? Whatever you do, it will be Epic. (Also, love your location shots–bluebells! J’adore! I like the pattern. You always amaze me how you don’t use precise pattern pieces and it always looks great. I’ll have to give that a try, too. I’d love to see a big lime green background for the backing with a little plum surprise that you do so well, too. I think Navy would be a perfect backing. I also like the little blue flowers with the grass in the photo if you could find a floral fabric to match. How about a funky white and black print for the backing! Love the quilt top! I love the colors you have chosen for this and it’s a fun pattern. Thanks for sharing this great new line. I am with the lime green people, think that would look awesome with it. Loving those mixed up plum solids. Nice! I also made two pillows. This line is funky and fun – I think I am going to do the green next.